Shortly after the Meiji Restoration the Japanese government began minting large silver yen coins for both domestic and foreign use. 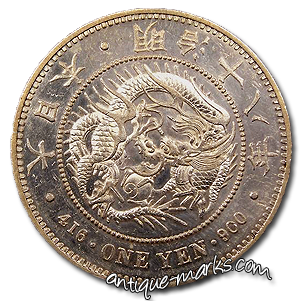 Japanese Dragon Yen coins are some of the most popular and sought after by modern coin collectors. But Western silver investors and coin collectors often prefer to focus on silver coins and bullion produced in the Americas and Europe. There are several reasons for this preference, but first among them is familiarity. It is naturally easier for collectors to identify coins from their own countries. Even coins that are foreign to the collector can be easily deciphered if their inscriptions and dates are recognizable. Western coins also tend to follow certain patterns: the obverse will often feature the portrait of the country’s monarch at the time of minting, or of a historical or mythological figure important to that country. Unless their designs are directly inspired by Western coin patterns, coins from Africa, the Middle East and Asia don’t typically follow these conventions. As a result, it can be difficult for western buyers to discern between different coin issues or even between genuine articles and counterfeits. One such coin is the Japanese silver yen, sometimes called the ‘Dragon Yen’, which was minted off and on between 1870 & 1914. This coin is popular and fascinating both for the beauty of its design and for its historical value, and it is well worth collecting. However, collectors who aren’t familiar with its common and rare dates and other aspects of the silver one yen coin’s mintage history may find themselves overpaying or, even worse, buying a counterfeit. In 1870, two years after the restoration of the Emperor Meiji to the Japanese seat of power in Tokyo, the imperial Japanese government began minting new coinage. This dire need for new coinage came as a result of Japan’s shift from the old pre-decimal ryo currency of the Tokugawa Shogunate to the new decimal currency, the yen. At the time, Japan was on the silver standard, so the government’s new coinage was minted primarily in silver. Under these circumstances, the new Japanese silver yen was born. A large, thick coin weighing 26.96 grams, the new one yen coin was minted in .900 fine silver. The size, shape, and composition of the coin were modeled after those of the Mexican eight-real coin, popularly known as the “Mexican dollar”, which was one of the most widely-traded coins of the day. Complications arose in 1871, when the Japanese government switched from the silver to the gold standard in an effort to keep up with American and European fiscal policy. As a result, Japan briefly stopped producing silver one yen coins in favor of much smaller gold one yen coins. The gold and silver yen ended up circulated alongside each other after 1878, when the Japanese government finally settled on a bimetallic standard. The history of the silver Dragon Yen is complicated, to say the least. The coin went through a few significant changes after its initial minting. The original 1870 design of the coin features a coiled dragon, enclosed in a circle, dominating the obverse of the coin, around which are inscribed the denomination and date of the coin in Japanese. The reverse depicts a large sunburst. The coin’s obverse and reverse would change over the years, but the dragon would remain on all future designs. 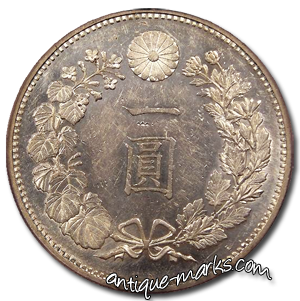 The 1870 yen is the only Meiji-produced yen coin that bears no Latin alphabet or Arabic numeral inscriptions. In 1874 and 1875, after a short halt in production, silver one yen coins were minted with a new design, now featuring the inscription “416 • ONE YEN • 900” on the border around the central dragon on the obverse. These coins were marked for foreign trade only, but they later fell into domestic use within Japan. From 1875 to 1877, the government briefly stopped minting silver yen and instead minted nearly identical silver coins designated as “Trade Dollars”. At 27.22 grams, these trade dollars were slightly heavier than the old yen coins. Japanese trade dollars look nearly identical to their one yen counterparts except for their obverse and reverse inscriptions, which read “420 GRAINS • TRADE DOLLAR • 900 FINE” and “Trade Dollar” in Japanese, respectively. By 1878, the government had again begun exclusively minting silver one yen coins in the 1874 design. Both the post-1874 yen and the trade dollar have totally different reverses from the 1870 yen; instead of a sunburst they bear the denomination of the coin in Japanese. The production of the 1874 design silver one yen coin lasted until 1914, after which no further silver one yen coins were produced. The Japanese government also minted smaller 10, 20, and 50 sen coins (100 sen = 1 yen) in various issues in .800 and .720 fine silver from 1873 onwards. The earlier of these coins bear the same dragon design as the one yen coin; these issues are .800 fine. Later 10, 20, and 50 sen types bear a sunburst on the obverse instead of a dragon and are .720 fine. The Dragon Yen is not difficult to find, in fact, some of its mintage dates are very common. Rare dates to look out for are 1874, 1875, 1878, and 1879. These early dates were produced in limited quantities and good specimens of the 1874, 1875 and 1879 issues can sell for upwards of one thousand dollars. 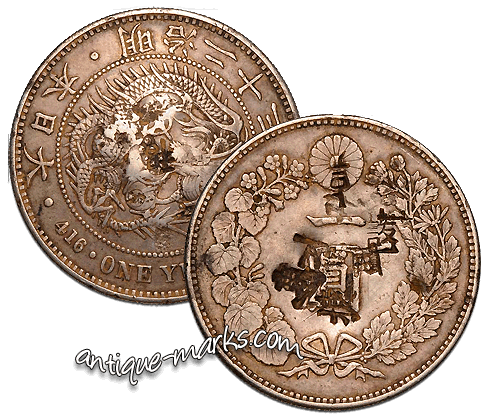 Original design silver one yen coins minted in 1870 will also sell for hundreds of dollars, as will the 1875 – 1877 Trade Dollar issues. Most other dates are considered common and can be picked up for fifty to one hundred dollars, depending upon the type, condition and wear of the coin. Perhaps the most interesting aspect of the silver yen coin is its history as a trade dollar used in China. In the late 19th century, China was overrun with foreign silver coins from the United States, Britain, Mexico, and other countries. These coins were used in place of local currency to conduct trade in China. After 1870, the Japanese silver yen also began to circulate widely in China. In order to designate that the silver one yen coins were intended for foreign use, the Osaka and Tokyo mints stamped the coins with a small mark bearing the Japanese character for silver. Stamps of these kinds placed by governments are called counterstamps. Counterstamped coins are not regarded as damaged by coin dealers or collectors, and many silver one yen coins bear either the Osaka counterstamp (placed on the left side of the reverse) or the Tokyo counterstamp (placed on the right). Tokyo-counterstamped silver yen coins are significantly rarer and generally sell for higher prices than do Osaka-counterstamped coins. Dragon Yen coins often bear very different kinds of marks, however. To protect against the rampant counterfeiting of silver coins taking place at the time, Chinese merchants and refiners punched indentations and sometimes unique marks into the silver coins that they came across. These marks, which are called chopmarks, served two purposes. First, they verified the metal content of the coin – copper fakes plated with silver were very common in the 19th century, and a chopmark in a fake would punch through the silver plating and reveal it as a counterfeit. Second, chopmarks acted as marks of guarantee, signifying that the coin was genuine. The latter type of chopmark generally took the form of a symbol or a Chinese character unique to a certain merchant or silver dealer. Because the one yen coin was one of the silver coins most commonly used in 19th and early 20th century China, many of these coins now bear chopmarks. Chopmarks are a complicated and much debated point amongst coin collectors. Most collectors seem to regard chopmarks as damage, but some may be willing to pay higher prices for interesting chopmarks that can be used to trace the path of a particular coin throughout Asia. Since chopmarked Japanese silver yen are so commonly regarded as damaged, however, they often sell for much lower prices than clean specimens. Counterfeiters have manufactured fake Japanese silver dragon yen coins since the late 19th century, and they continue to do so today. If you’re interested in a particular coin of this type, do your absolute best to verify that it is genuine. Make sure that the design of the coin matches the genuine article and that the coin bears a mint date when the silver yen coin was actually minted. In addition to those listed above, gaps in production occurred between 1898 and 1900, in 1907 and between 1909 and 1911. If you can’t decipher Japanese dates, search the internet for Calendars that feature Japanese to Western year translators. Sadly, many of the silver one yen coins offered for auction on eBay are fakes. You’re almost certainly better off buying your silver yen coins from a trusted and established coin dealer. While some fakes can still slip past the professional, you are still far less likely to buy a counterfeit Japanese Silver Yen (Dragon Yen) from a trusted expert coin dealer.